In December we reviewed the Cycliq Fly6 rear light and camera combo, and found it to be a convenient two-in-one combo that made recording commutes, races and rides ultra simple while keeping you safe at night. 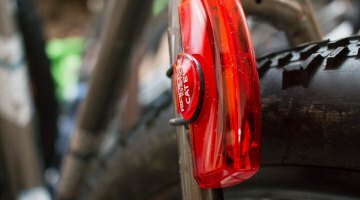 Its simple rubber strap design made mounting and removing the light from any bike a snap, and the one-button operation made it foolproof even when mounted upside down to capture a brief attempt to chase Adam Craig. 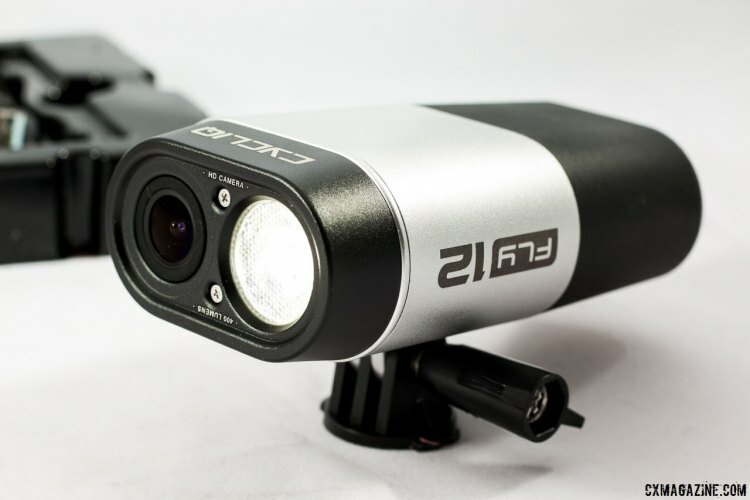 Cycliq now has released its long-awaited Fly12 headlight and camera combo, and the 400 lumens light and HD camera aims to bring the Fly6’s utility to your handlebar, and your POV to videos. If you’re of the belief you need a cyclocross bike, gravel bike, dirt road bike, adventure bike and monster cross bikes to adequately tackle the varied terrain of your rides, the Fly12 combo probably isn’t for you. As with almost any combination product, there’s some compromises in trying to do it all. But for many of us overwhelmed by too many choices, the Fly12 is a simple solution to consolidation and performs as a camera and light quite well. The camera boasts full 1080p HD resolution at 1920 x 1080 pixels, and shoots at this quality at 45 frames per second. Need more frames for your slow-mo hero footage? You can downsize to 720p at 60 frames per second, and if you need to capture every minute of your gravel grinder, there are 30fps modes in both 1080p and 720p (the Fly6 we reviewed shoots at just 720p). 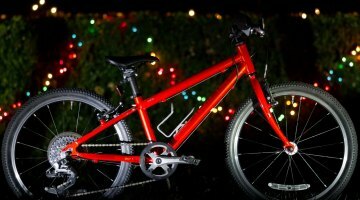 If you find yourself riding in the dark, you don’t have to sacrifice handlebar space to add both a light and camera. The 400 lumens light features a whopping nine different modes, with three levels of brightness in constant, flash and pulse modes. The device uses a class 10 speed microSD memory card, and comes with a 16gb card. The 16gb card was good for about 100 minutes of video at the highest resolution and frame rate. If you need more minutes and don’t want to downsize, the Fly12 accepts up to a 64gb microSD card (about a $20 upgrade). The Fly12 utilizes both Bluetooth 4 and WiFi for connectivity, configuration, and video review and sharing, but neither are technically required if you just want to record and light your rides. Just as with the Fly6, the Fly12 has just two buttons. One is to turn it on and toggle between light modes, and the other is to enable WiFi. There are no menus or screens to either help or confuse you. 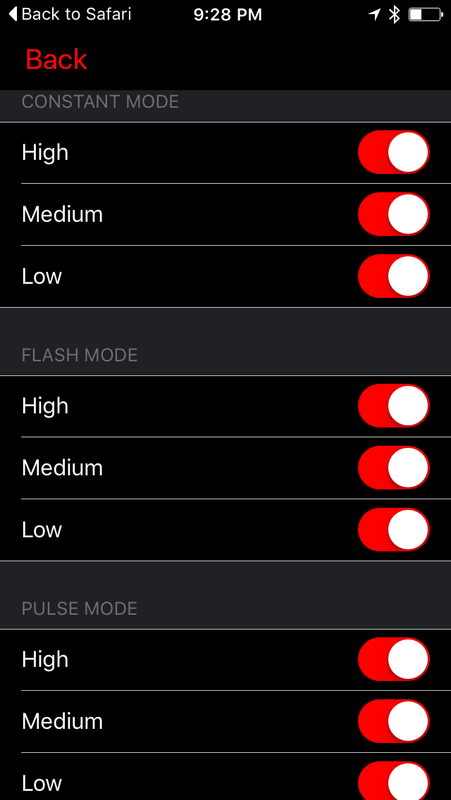 To change settings between video recording modes, and select which light modes are enabled, you’ll need an Apple iPhone or iPad running Bluetooth 4 and the CycliqPlus app, available from iTunes. Got an Android or Windows device? You’re out of luck for now, but Android users have an app coming for their devices, and Fly12 packaging already indicates a Google Play Store app is near. You can also turn on or off the different light modes on the Fly12, to reduce the number of button presses to get to your preferred light modes. Setting up the Fly12 on your handlebar is relatively simple as well. 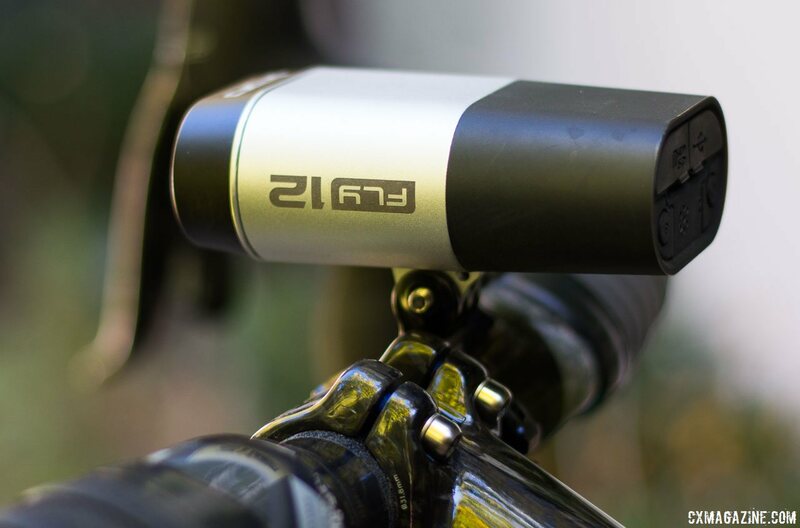 The company includes a Go Pro-compatible aluminum handlebar mount. Use a 3mm Allen key to clamp the mount to your bar, and then tighten the thumbscrew to secure the camera to the handlebar. Some handlebar shapes, when paired with thick handlebar tape, can make tightening and loosening the thumbscrew challenging due to tight clearances. For Strava users, you can even integrate your Strava stats and overlay them over your video, allowing you to see your heart rate, power, speed and elevation as you attack your riding buddies, or fall off from their attacks. See the sample video of this overlay in the slideshow below. In operation, the Fly12 is super simple to use both as just a camera and also as a camera and light simultaneously. The Fly12’s memory card never fills up, but keeps overwriting old footage, and thus is always ready to go as long as the battery is charged. When it’s on, it’s always recording, but it can record with or without the light being on. Need some light but don’t want to record some risqué activity? Just don’t share the footage. Have an accident? 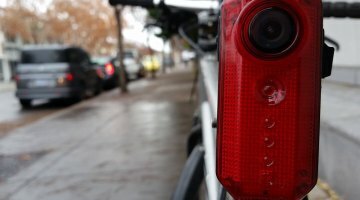 The camera detects when the bike is lying on the ground, and shuts off after a period of time to save the footage in case you’ll need it for legal reasons. The Fly12 is easy to use, and it adds peace of mind when you’re riding in traffic. The video isn’t the highest quality action camera footage we’ve seen, as both GoPro and Shimano cameras appear to be a bit sharper when you pixel peep, but if you’re not expecting to sell out theaters with your footage, it’s plenty sufficient, with the added bonus of being able to film in the dark. 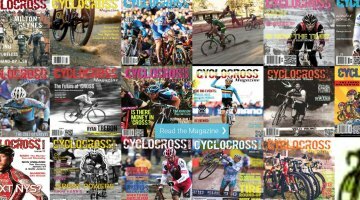 It’s sharp enough to decipher license plates of passing cars, and race numbers of cyclocrossers you pass. We do have a few notes and one complaint about filming your ride in the dark. The beam pattern of the light, like most headlights, is round. This essentially leads to massive vignetting of your video (dark corners, see our video below), reducing the field of view of your footage. Of course, by pairing a GoPro with a handlebar light, you’d have the same effect. However, if you tend to stay from the paved path at night in dry conditions, the light’s position right next to the camera lens can be problematic, because that dust is perfectly illuminated right in front of the camera lens. The footage will look like it’s snowing outside, or like you’re being attacked by flies, especially if you’re following someone else on the trail (see a clip of the dust footage towards the end of the video below). A separate camera and light mounted in different spots would allow you reduce this effect, but introduce more shadows. 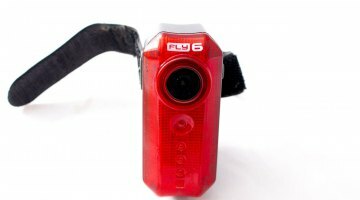 If you’re a weight weenie and need a camera just for race day, the Fly12 is not for you. With a big capacity 4400 mAh battery and metal casing, the Fly12 is a heavy option (235g / 8.2 oz) to document at 60 minute (or shorter) race. But it’s a fine option to leave on your bike to document and light your commutes, your Wednesday Worlds triumphs, and Sunday sufferings. With the light off, you can expect up to ten hours of recording time, making it possible to record your whole gravel grinder, even if you finish in the dark. 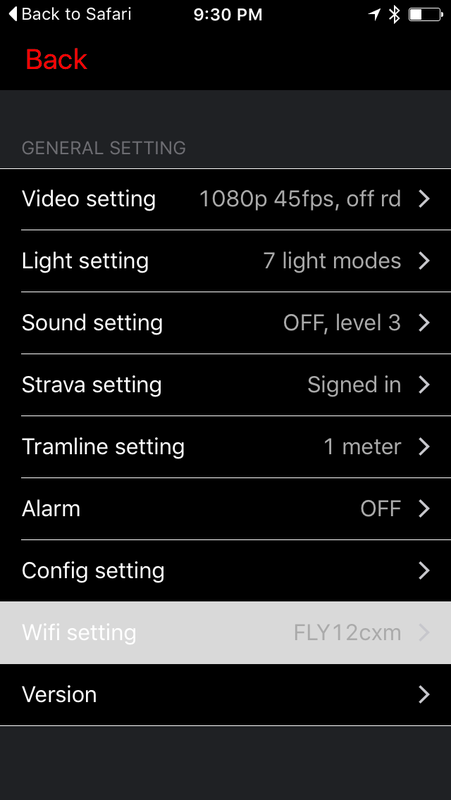 The Fly12 and Cycliq iPhone app lets you trim and save video segments to your phone, then share with your ride buddies. To view and share your videos without a mobile phone, you can always simply remove the microSD card and plug it into your PC, or connect to the camera via its micro USB charging port. You don’t need an iPhone for day-to-day operation. Our biggest complaint is admittedly minor, but charging the light is inconvenient due to the handlebar mount, unless you’ve got a micro USB charger with a long cord near where you store your bike. Removing the light from your handlebar is a one-minute exercise at worst, but having to unscrew the camera from the mount is tedious and will inevitably change your setup angle. It’d be far easier to pop out a battery and plug it in a charger while leaving the light in place, similar to how many high-end cameras work. Another alternative would be a quick-release snap mount, but that might introduce more camera shake. Lastly, 400 lumens is plenty for a commute and to light up the trail, but may not be enough light for aggressive, technical high-speed trail rides. A few years ago we might have said 400 was more than enough, but as lights have evolved, we’ve grown dependent on 600 lumens or more. One simple solution for more epic adventures would be to pair the Fly6 with another light, mounted either on the handlebar or helmet (and then have the added benefit of a back-up light). 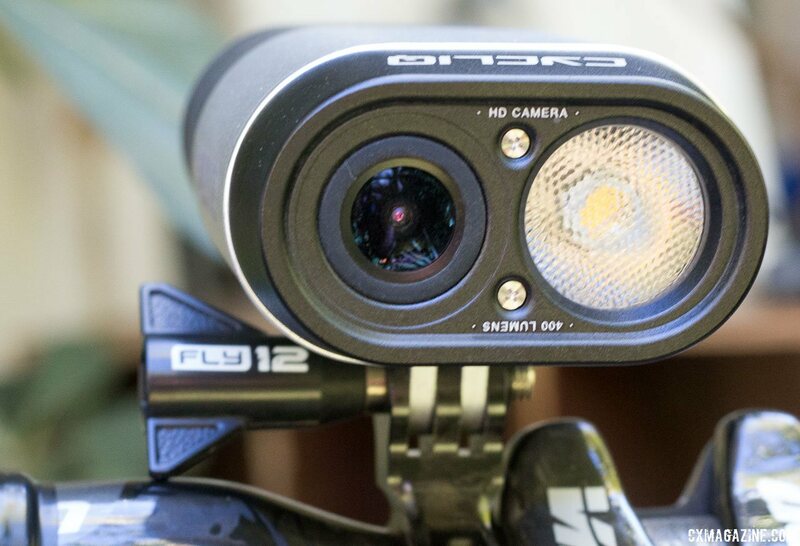 Despite those complaints, we expect the Fly12 to find a permanent home on our handlebar during training sessions, and find the $349 list price to be competitive to buying separate cameras and lights. 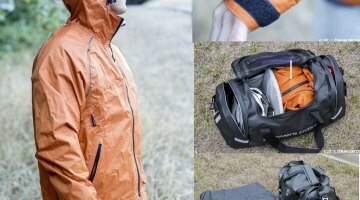 We found the Fly6 to be a smartly-designed product that also makes a great gift idea, and the Fly12 also makes a great gift, albeit not a cheap one, for the cyclist in your life, with the added benefit of living vicariously through the recipient’s rides.